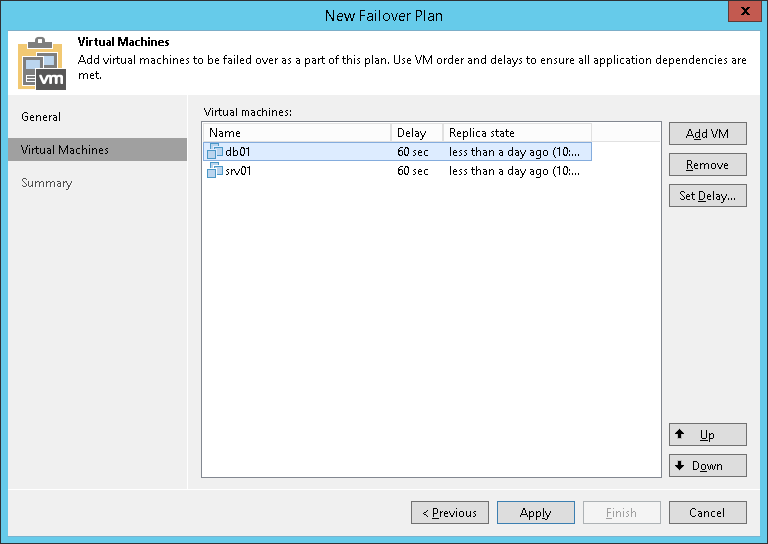 At the Virtual Machines step of the wizard, select VMs that you want to add to the failover plan. You can add separate VMs and whole VM containers. To quickly find VMs, you can use the search field at the bottom of the Select Replica window. Enter a VM name or a part of it in the search field and click Start search or press [ENTER]. A source from which you add a VM to a failover plan does not matter. When you run the failover plan, Veeam Backup & Replication always fails over to the latest restore point of VM replicas. To fail over to a specific restore point of VM replicas, use the Start to command. For more information, see Running Failover Plans.